If you’ve become discouraged with your freelancing pay thus far, perhaps you’re looking at the wrong markets. Freelance auction sites are filled with people offering their writing services for a few dollars per article, and it’s hard to compete if you’re hoping to support your family with your writing, you’ll either have to be exceptionally prolific, or find some markets that pay a reasonable rate for your time and effort. If you can research some pretty obscure topics, websites and print magazines dedicated to various B2B markets and trades can pay handsomely. Even websites selling warehouse equipment look for content to help them rank in the search engines and draw customers back to their site, so if you can write articles on the newest innovations in forklifts, or expound upon warehouse safety best practices, you may be able to avoid the low paying “easy” jobs and head straight for success writing about things you’d never really thought of before. These aren’t publications you’ve ever seen on a newsstand or have in your feed reader. Consider places like The Packer – a magazine dedicated to the fresh produce industry; or Screen International, a magazine and website dedicated to international film industry news; or how about Greenbuild Magazine, which covers sustainable construction in the UK. I bet you’ve never heard of these sites and magazines, but each month these and thousands like it need to put out enough quality content to produce a magazine their market will read. If you can find an interesting anecdote, or an interesting person to interview in an obscure field of work, there’s sure to be a story in it somewhere that you can pitch to a magazine you’ve not yet heard of. Look at people who live near you for inspiration. What industries do they work in? What information can you glean about their work from talking to them. Are they doing something that might make an interesting article you could sell to a trade magazine? Talking to your friends and neighbors about what they do will not only make you a valued friend — people love friends who show interest in what they do — but can provide you with topics and market inspiration that can advance your freelance career. 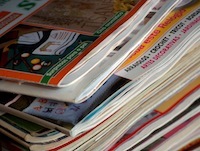 So before you sell yourself to the highest bidder online, take a look around you and search for the magazines you don’t find in newsstands, and the websites you’d have to know about to find… they could provide the path to freelancing success.